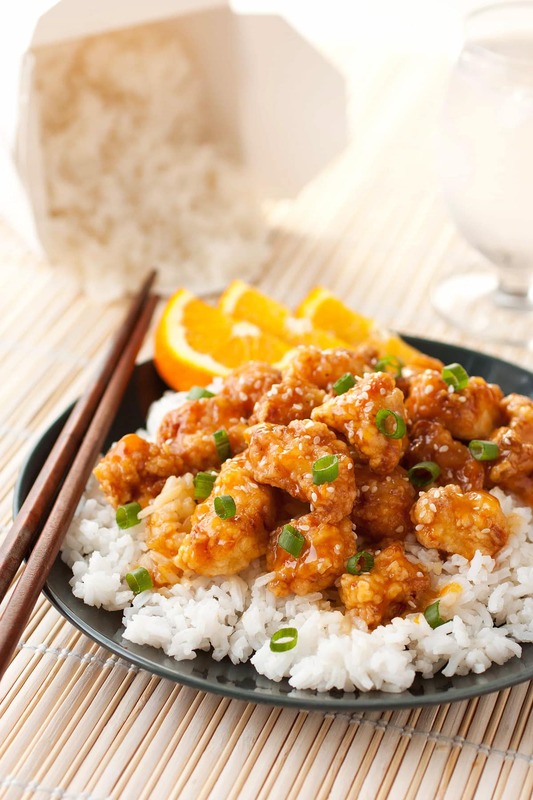 Chinese Orange Chicken better than you’ve ever had before! It’s brimming with fresh orange flavor — no jarred orange marmalade or corn syrup here. It far outdoes Panda Express and other Chinese chain restaurants orange chicken. You get bite-sized pieces of chicken that are fried to golden brown perfection, and they’re coated in the most amazing, sweet and sticky sauce. Talk about delicious comfort food! 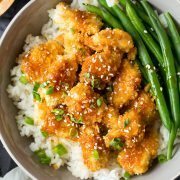 This easy orange chicken recipe is a super popular classic Chinese take-out dish that’s super popular here in the U.S. and for good reason. It’s battered and fried pieces of chicken coated with an irresistible sweet and tangy orange sauce. It’s just too good! Everyone in the family will love this recipe! It will likely be one of those recipes that the spouse, kids, friends, parents, etc. request again and again. The secret is in the sauce here. The orange sauce is really is what makes this recipe so good! It’s a delicious blend of fresh orange juice and zest, plus chicken broth — because why use water? Then you also get a sweet, salty and sour blend from the sugar, soy sauce and vinegar and then there’s even one more layer of fresh flavor from the ginger, garlic and onion. Skip the take-out tonight and make this delicious take-out style dish at home! 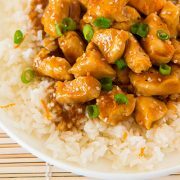 To make this homemade orange chicken, you marinate chicken pieces in a simple orange chicken sauce, while setting aside 1/3 of the sauce and thickening it for coating at the end. And you finish by coating them in that truly irresistible orange sauce. 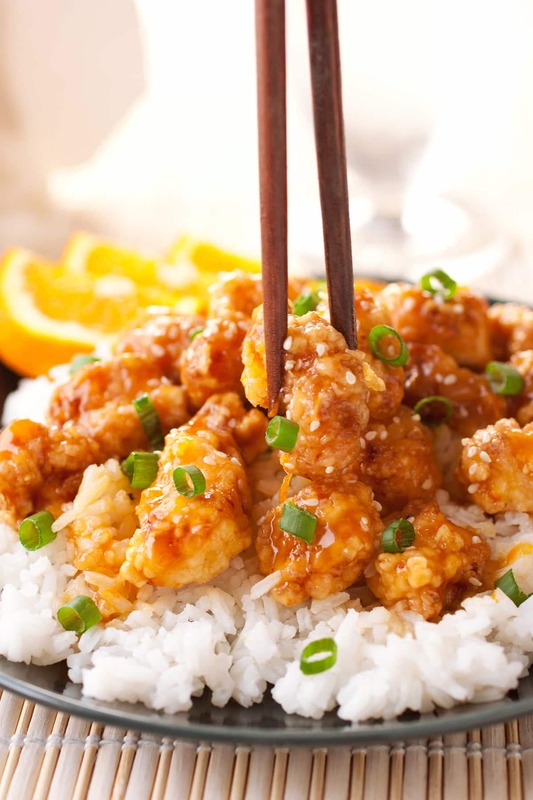 It may take a few steps to make Chinese orange chicken, but after one bite you’ll realize it was most definitely worth it! To make it just a tad healthier you could try swapping out half of the sugar with honey for another delicious option. I just don’t recommend using all honey or the flavor will be too strong. 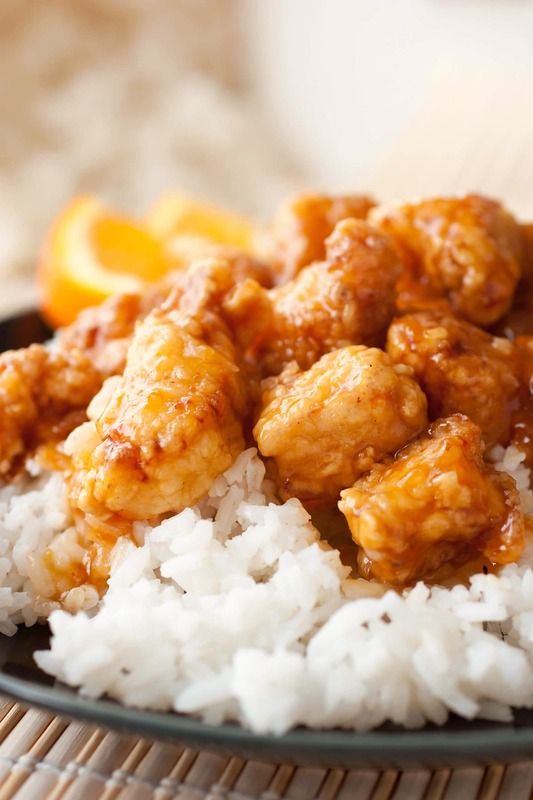 If you have leftover orange chicken, don’t reheat it in the microwave! The chicken will lose its crispness and become rubbery. Instead, reheat the Chinese orange chicken in a skillet with a drizzle of vegetable oil. You want to warm it over medium heat and stir every once in a while to heat it evenly throughout. Fry the chicken in batches to prevent the oil temperature from dropping. The oil needs to stay hot enough to fry the chicken properly. Freshly squeezed orange juice is key in this recipe. The bottled stuff doesn’t compare! I like to garnish my homemade orange chicken with sesame seeds and chopped green onions. It adds a pop of fresh flavor and nice texture. This is the best Orange Chicken I've ever had! It brimming with fresh orange flavor and it far outdoes the popular Chinese chain restaurants. You get bite size pieces of chicken that are fried to golden brown perfection and they're coated in the most amazing, sweet and sticky orange sauce. Talk about delicious comfort food! Place chicken pieces in a gallon size resealable bag, set aside. In a medium saucepan combine chicken broth, orange zest, orange juice, vinegar, soy sauce, granulated sugar, ginger, yellow onion, garlic, Sriracha and pepper. Whisk mixture well, then measure out 2/3 cup of the mixture and pour it over the chicken in resealable bag. Seal bag while pressing excess air out, and press chicken into marinade. 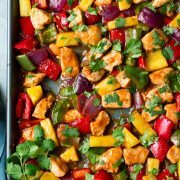 Place bag in a bowl or baking dish and refrigerate 30 minutes. Meanwhile, return remaining sauce mixture over medium heat and bring mixture just to a boil, stirring frequently. In a small bowl whisk together 2 Tbsp cornstarch with 2 Tbsp water then stir mixture into sauce. Reduce heat to medium-low and cook 1 - 2 minutes longer, stirring constantly, until thickened, remove from heat. Pour vegetable oil into a large cast iron dutch oven, filling pot about 1 1/2 - 2-inches deep and heat oil to 350 degrees. Meanwhile, whisk eggs in a shallow dish until well blended. Pour remaining 1 1/4 cups cornstarch into a separate shallow dish. Remove chicken from refrigerator and drain and discard marinade from chicken. Dip chicken pieces into egg followed by cornstarch and toss pieces to evenly coat in cornstarch, then carefully place 1/3 of the chicken pieces into preheated oil and cook for 5 - 7 minutes until golden, turning once during cooking. Using skimmer, remove fried chicken from oil and transfer to a paper towel lined cookie sheet to drain excess oil. Repeat process with remaining chicken working in two more batches. Pour drained fried chicken into a bowl and toss with sauce. Serve warm over white or brown rice garnished with green onions and sesame seeds if desired.